When I heard of a dish called Chicken Vesuvio, I immediately assumed this was an Italian dish because of the name. To me it seems derived from Mount Vesuvius the volcano that erupted back in 79 AD and destroyed Pompeii and Herculaneum. Well upon further research this Greek mythology, architecture and history buff was wrong, Chicken Vesuvio is a speciality of Chicago and is an Italian-American dish. Cook Time: 45 – 50 min. 2. Season chicken with spices and then using a cast iron skillet, pour some extra virgin olive oil in over medium-high heat. 3. Sear all sides of the chicken breast and turn off heat. 4. Cut the potatoes in wedges and coat with the fresh herbs. 5. Place potato wedges around the chicken breasts and cook in oven for 45 minutes. 6. Transfer chicken and potatoes to a plate. 7. Add onion and garlic to the skillet oven medium-heat to soften. 8. Using a wooden spoon scrape the flavour from the bottom on the skillet. 9. Stir in the flour to make a roux. 10. Slowly add in the chicken broth letting the flour dissolve to your preferred gravy consistency. 11. Add wine if desired. 12. Cook for 3 – 4 minutes and frozen peas. 13. Add chicken and potatoes back into the skillet and let simmer for 5 minutes and serve. Sometimes I am on a real cooking streak and everything I make just comes out smashingly. This one after I made it I was actually considering making it again the same week; because it was that good. 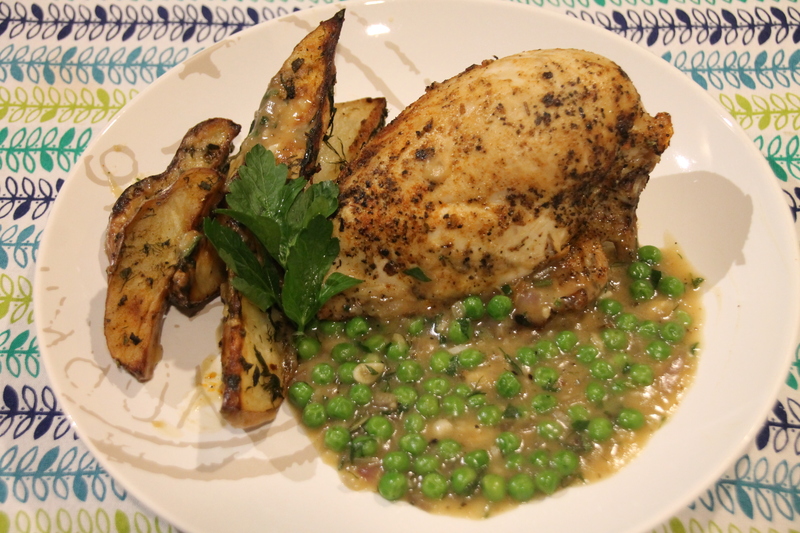 The chicken was moist and juicy, the potatoes were firm and savoury with the fresh herbs and a scratch gravy turned out most excellent again (Thanks Chuck). I will be making this for dinner when I have guests as it a simple yet classy sophisticated dish.